Sophomore Joe Pereira (photo) and freshman Corey Trivino spent their summer week on Long Island as far from the trendy East Hampton beaches as possible. Before officially becoming Terrier teammates, they were teammates on Bryan Trottier’s white team at Islanders development camp in Syosset on the Long Island Sound side of the island. 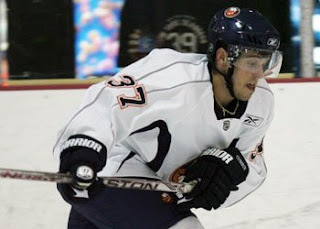 Both Trivino (#36) and Pereira (#37) can be seen skating in a video clip with miked teammate Michael Haley and, in the latter part, Haley, a pro for several seasons, offers some tips to Trivino. Trivino, who’ll soon head to Canada’s World Junior team tryout camp, discussed his first pro development camp with NHL TV. Pereira, an undrafted invitee, was recommended to the Islanders by St. Joseph’s CT coach Marty Crouse, who like Pereira was a standout player in West Haven. Pereira talked about his camp experience and playing for Jack Parker in a feature on the Isles’ AHL affiliate Bridgeport Sound Tigers Web site. Pereira wasn’t the only member of his family doing some summer skating. Younger brother Mike, who followed Joe to South Kent School where he the team in scoring (27-25-52) as a sophomore, was at the recent national Select 17 Festival in St. Cloud, Minn. With a strong effort during the final few games, he finished among the event’s top scorers, as did Culver Military Academy forward Kit Sitterley, who previously expressed interest in BU. Both Vinny and Victor Saponari played prep hockey at Culver. On Aug. 2 and 3, freshman David Warsofsky and his brother Ryan, a second-year defenseman for Sacred Heart, trade their skates for cycling shorts to participate in the 29th annual Pan-Massachusetts Challenge (PMC), the nation’s pioneer charity bike-a-thon that raises more money than any other athletic fundraising event in the country. They will be among the more than 5,500 cyclists who will ride with the collective goal of raising $34 million for lifesaving cancer research and treatment for adult and pediatric cancer patients at Dana-Farber Cancer Institute through its Jimmy Fund.